Please Note The Forum Post Is Not One Hundred Percent Complete. More Information Will Be Added In The Coming Days. 7. Remember that you are roleplaying as a state, and at times oppose committing forces to battle if it will lead to major losses for your soldiers. 12. 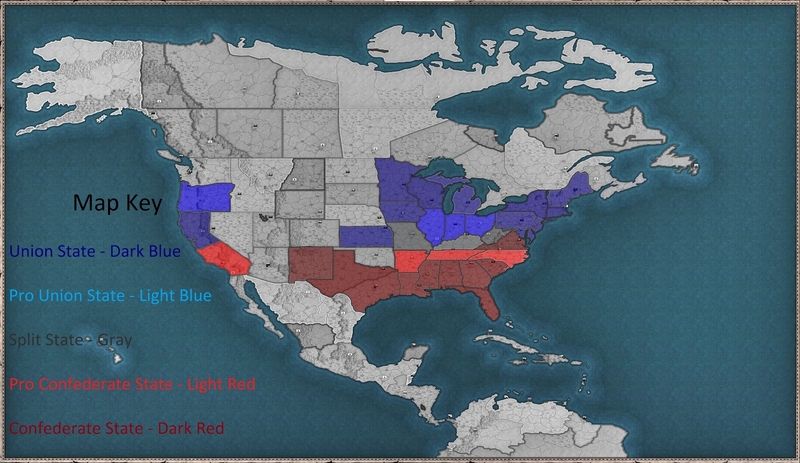 Read the About The American Civil War so you can understand the situation and not join the Roleplay going in blind. It is November 6th, 1860. Abraham Lincoln of the Republican Party has successfully managed to win an electoral majority of one hundred and eighty votes thanks to the Democratic Party splitting into the Southern Democratic Party and Northern Democratic Party. With Abraham Lincoln winning the race to the presidency politicians from the south have begun talks of seceding from the Union due to the Republican Parties harsh abolitionist platform which the South views as a way to completely devastate the Southern Economy. With Abraham Lincoln set to enter office on March 4th, Southern States are making drastic preparations to leave the Union to preserve their state sovereignty and to resist the political dominance of the North in Congress and the Presidency. The post was edited 19 times, last by President Magnum2016 ( Sep 4th 2017, 6:18am ). Both the Union and the Confederacy will have a player representing the Federal Government. This player has immense powers over the states and is the de facto leader of the country. The Federal Government for the Union will be based in Washington D.C. and Pennsylvania while the Federal Government for the Confederacy will be based in Virginia. Cotton Is King is a popular phrase that has spread rampant throughout the South for the past several decades. Although the Southern United States lacks effective industrialization it accounts of nearly sixty percent of all exports for the United States causing the Southern Elite to believe that if the South were to abandon the Union their nation would be extremely prosperous and they can control the foreign affairs of Great Powers such as France and the United Kingdom which are highly dependent upon Southern Cotton, Tobacco and Sugar Cane. If the Southern States were to abandon the Union the Unions first task would be to construct an effective blockade across the Southern United States to starve the Southern Economy and force them into Economic Ruin however this will not be a easy task as the Southern States may be forced to breach the Union blockade to import European made weaponry to aid them in their war of independence. The Confederacy lacks the industrialization of the North and is heavily reliant on King Cotton which allows it to hold massive sway over the Industrialized World. As such the Confederacy will be capable of sending trade ships (Destroyers/Cruisers) into European Markets (Edge of the Map) and then once they have arrived within the European Harbors and unloaded their goods they will then have the ship loaded with weapons and sent back to the Confederacy which is successfully will see the Confederacy rewarded with weapons (Militia or Infantry). If the Confederacy successfully breaches the Union Blockade and returns home then it will be capable of receiving large shipments of weapons that will allow it to arm its armies. Note that the rewards below are applicable to change for instance if the Confederacy manages to constantly breach the Union Blockade and practically destroys the Union Navy then the amount of ships required to receive rewards will substantially increase and if the Union manages to keep the Confederacy from breaching the Blockade the rewards will increase substantially to represent Europe's need for cotton and other crops. This Economy is also applicable to change via world wide events for instance at times cotton may be sold for very high prices or it may be sold for very little if for instance India were to increase its surplus tremendously. Each ship that successfully breaches the blockade and returns home gives the Confederacy 1 Point To Purchase European Weapons. The post was edited 5 times, last by President Magnum2016 ( Aug 28th 2017, 10:53am ). The American Civil War was a logistical nightmare for both combatants. Supply Lines were constantly overextended on both sides due to the massive armies that both sides fielding and the massive amounts of resources the armies required. Due to this armies were forced to advance slowly across the Great Frontier of the Eastern and Mid-Western United States. This led to offensives frequently being bogged down and repelled due to the defender being able to divert forces from other fronts to repel the invading army before the invaders mission could be accomplished. This will be represented in the Roleplay by implementing a restriction on the amount of provinces each state can lose per day. Which will be detailed down below. A single state may only lose four provinces every day which restarts on Day Change. This is to represent the issues that invading armies faced during the Civil War as the amount of time it takes to conquer states is incredibly slow which will allow the defending army time to regroup its forces and mount a large scale offensive. To make offensives even harder to conduct successfully if one side manages to mount an offensive to retake previous lost land they once held they are capable of taking eight provinces per day instead of four assuming they were originally part of their factions lands and the state did not surrender/switch sides. Meaning that the invading armies gains could quickly be taken away from them just as soon as they were gained. However keep in mind that a state may only lose 4 provinces per day not the entire Union/Confederacy which allows multiple offensives in multiple states below is a visual representation to show how this works. Now at first glance this picture might look rather confusing however if my art skills are truthfully as terrific as I believe they are this will allow you to fully understand how the offensive system will work in the roleplay. 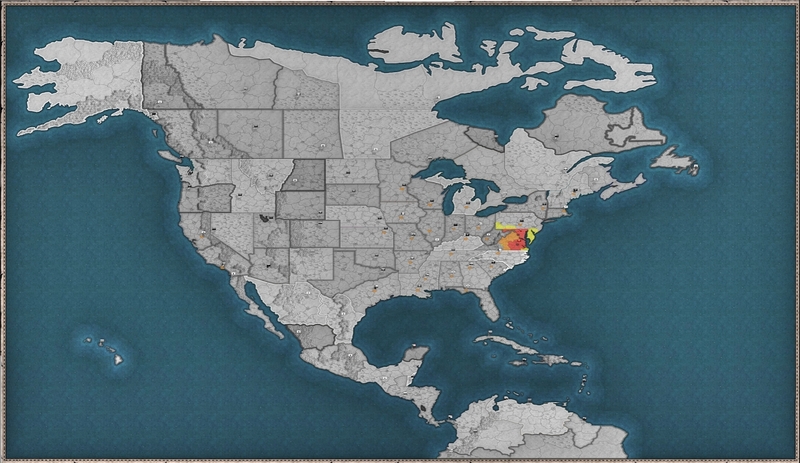 The Union conducts an offensive within Virginia and Tennessee and successfully manages to take 4 provinces from both Virginia and Tennessee as per the rules it is able to take a max of 4 provinces from a state per day which is restarted on Day Change. The Union continues their offensive and manages to conquer the Eastern Portion of Tennessee and successfully reaches the borders of Richmond Virginia. At this point the Unions Offensive is hitting its climax as it is now capable of starting an offensive within Georgia, Alabama, North Carolina and continues to finish off Virginia. So while the Union can only take four provinces from a single state per day they have successfully managed to secure sixteen provinces in a single day due to them attacking multiple states at one time. However this offensive has left them rather exposed and overextended and has without doubt given the Confederacy time to mount an effective counter attack. Call of War provides an incredible selection of World War Two Units that stretch from basic militia men to Heavy Tanks, Strategic Bombers and even Nuclear Rockets. However for obvious reasons the majority of these units will be banned from the Roleplay below is a list of every allowed unit within the Roleplay and what they are to be represented as within the Roleplay. Militia will be the backbone of the Confederate Armies and less Industrialized Union Armies in the initial stages of the American Civil War. Composed of mainly National Guard units and homegrown militia men they lack the training and modern rifles and artillery that Infantry Divisions use however they make up this lack of training and weaponry by their unwavering morale to protect their homeland making them very capable in defending the Homeland especially in terrains such as forests. Infantry Divisions are the backbone of Industrialized Stages, they have gone through standard training and are equipped with both Modern Rifles and Artillery. In the early days of the Civil War professional soldiers will be in short supply however as the war escalates eventually they will become common on the battlefield. Calvary are capable of quickly reinforcing allied forces in the event of a major battle as well conducting quick and effective skirmishes against unguarded enemy forces however they lack in combat effectiveness during attacks on Towns and Mountainous Regions and when put against Infantry they will in most situations be routed. However in Open Fields they are capable of utilizing their speed to its full extent and can effectively flank enemy forces and change the tide of the war. Artillery is banned from the roleplay because I fear it would take away from the realism of the Civil War as artillery during this time was short range while Artillery in Call of war is capable of firing 60KM which is largely unrealistic for this time period. Instead Militia and Infantry groups will be roleplayed as having Artillery within their ranks. Destroyers will represent Frigates, although relatively ineffective against larger warships they are capable of effectively performing reconnaissance missions and protecting larger warships. They are also cheap to construct and are capable of being produced in record time. Cruisers are the main force of naval superiority that both the Union and Confederacy possesses. Heavily Armed and possessing impressive speed they are a force to be reckoned with. Ironclads are revolutionary Armored Warships that are available later in the war. Capable of taking fire for extreme duration of time with little damage thanks to their powerful armor they are capable of destroying Destroyers and Cruisers with ease. The post was edited 2 times, last by President Magnum2016 ( Aug 28th 2017, 10:39am ). Extensive Fortification Systems are a must have in this deadly civil war, allowing defenders to take on armies twice their size if properly constructed as well as deterring enemies from attacking strategic locations. The Confederates as they will be on the defensive for the majority of this war will have a much more intricate Fortification System than the North. The system for which a state to leave the Union is fairly simple. They must [obviously] roleplay about it for several days and then they are free to either have the state government vote on secession and if successful they will be free to leave or they may have the civilians overthrow the states government and then vote on leaving the Union such as what happened in Texas. For Balancing purposes the Union is not allowed to use force if states leave the Union if they are Pro-Confederate or Confederate States as it would cause instability in the roleplay. With the ever growing fear of a Civil War breaking out within the United States leaders on both sides of the spectrum will be forced to carefully manage their political resources and make difficult choices on what is of the gravest importance for the nation. Even though these choices may cause outrage against their population and even ranks within their ranks. Political Points are used by both the Confederacy and United States Federal Governments and allow them to construct fortifications along the frontlines, conscript forces etc. Each side gains Two Political Points per day. Certain States do not possess the Economic capabilities to mass produce equipment on a large scale and as such this is to be represented in the Roleplay as displayed above. The post was edited 7 times, last by President Magnum2016 ( Sep 3rd 2017, 10:26am ). I hereby agree to follow all of the rules and guidelines presented within this roleplay as well as any future rules or guidelines that are created. I agree to be expelled from the Roleplay if I repeatably break the rules and/or refuse to cooperate with the Roleplay's Staff. The post was edited 1 time, last by President Magnum2016 ( Sep 3rd 2017, 10:18am ). Roleplay Example: To End All Wars, Fall of Roma, Modern Roleplay, Fallout Roleplay etc. The post was edited 2 times, last by President Magnum2016 ( Aug 28th 2017, 10:57am ). As the conversion of Portugal and its royal court to Orthodoxy has been rather disrespectful towards those kingdoms and states that were once its allies, especially towards the Kingdom of France, who chose to break off diplomatic relations after such a dastardly action. However, recent developments have reinvigorated and reestablished the official Franco-Portguguese Military Alliance. The Princess of Portugal is to wed Crown Prince Charles VIII of France, and thanks to both being catholic, it is accepted on behalf of the curia and its respective controlling cardinals. The Franco-Portuguese Alliance is once again whole, and France continues work on expanding within the borders of what is to become France. Of course, Another agreement has been established with Portugal in order to confirm that the Catholic Portuguese majority is to be respected and not forcibly converted by any sort of action taken by the leadership of Portugal. Upon this mutual agreement, France continues to build up its political leadership and expansionist plans. Papal Elections: A Wild French Cardinal Appears! Jacques de Beaufort, a French Cardinal with 58 years of life, born in the Languedoc region of France has been chosen to be a representative running for Curia Control. Related to Pierre roger de Beaufort, one of the french popes of Avignon, Cardinal Jacques de Beaufort stands against the idea of any sort of religious schism within the church and seeks for the unity of the religion entirely. He Intends to get rid of the force that the pope uses to excommunicate left and right, and hopes to allow catholic nations to deal with heathens and make deals with them, on the condition that they also support one another in attacks and establish a holy league of nations for defensive purposes. French Influence within Europe is palpable at this point in time, and in order to further gain power and influence the nations surrounding it, the French King Louis XI now schemes to unite the church by the means of papal control. Cardinal Jacques de Beaufort now stands among several other catholic powers vying for control and administration within the catholic church. It is clear that whoever wins this religious and diplomatic battle will be responsible for redistributing the control and administrative capabilities of the Pope and the church, so it is utmost that a power that is not within the Holy Roman Empire should be represented to keep the HRE from being able to choose new leadership at any time they desire. Similarly, A pope that is in a union or a political alliance with protestants should also never be considered as it is heathenistic at best and blasphemous at worst. France has now conquered the southern reaches of French cultural borders, including the northern pyrenees and most of the Atlantic coast, however a new issue has come to bear its ugly head within the empire. The fact that none of the three French Holdings have any sort of safe land connections in the case of Occitanian or Burgundian aggression has led to French aims to wipe out Toulouse, and military preparations have begun to take place in order to find an appropriate path to invade the strong and defensive kingdom. -France is to gain the provinces of Chambery and Moutiers. -Resources and an undisclosed amount of financial material is to be given to Savoy. -A trade agreement is to be signed between both states. -Military access is to be established between both states. THE ISLAMIC EMPIRE OF MINNESOTA, Im kidding, The State of Minnesota. I am my guy Alexander Ramsey, the greatest minnesotan republican to ever live! Ever since the end of the First World war, and the reclaiming of massive lands, filled with the Romanian speaking and ethnically Romanians, Romania has be wishing for the chance in order to finally unite the whole of the Romanian people, under the Romanian flag, and under the leadership, of King Ferdinand I, which many of the Romanian people have called, “The Uniter of Romanians”. However, the lands gained off of the dead Austrian Empire, was not the lands in which saw all of the Romanian people, in fact, many Romanians still live on, suppressed and given the lack of leadership and representation from the Austrian government. The King proclaims that this one the major reason which he had ordered that all of the Romanian people, are to, and ought to be united under a single state of Romania, and that no nation nor culture of hate shall ever destroy the united spirit of the Romanian people. Today, shall be marked as the day in which I, King Ferdinand, the United Spirit of the Romanian people, hereby state, that the people of Romania, shall no longer, and shall never, be disunited by foreign states, and that all Romanians, so long that the state in which is stated, (That being Romania), is free to do whatever that is deemed necessary in order for the protection of the people of Romania, the nation of Romania shall be the beeken of freedom of the people, in which it stands also for the people, and shall never deny the people, the rights in which they should rightfully deserve, and any nation, in which actively denies the rights of the Romanian people, shall feel and the effects of the united force in which is the holy spirit of the Romanian people, so help us all god. May god give his utter blessing to the people of Romania, along with the crown, so long a Romanian is never forcefully subjected in the state of The Kingdom of Romania, so long said person has not commit a crime against his fell brothers, for that he is not a true Romanian in spirit, he if is able to hurt or kill another Romanian, simply due to an argument in which can always be solved peacefully. With the King declaring that the people of Romania, shall be finally united, the Army has been given the command to make ready to follow throw such orders. The start of the united front to bring Romania together, starts in Austria, a long time denier of rights of the Romanian people. During their rule over the people of Romania, in Transylvania, the Romanian people had through the ruling of Austria, never be given the rights in which they so rightfully deserved, with denying the rights of running for political offices, all the way up to their utter destruction due to the failure of them being able to allow other culture groups to serve for their rightful position within the government, the inability to recognize the people of the region's ethnic, religious, and cultural differences. Today, the Romanian king calls the final steps to finally freeing the people of Romania, from the chains of slavery, with the masters being the Austrian King, and the unethical bureaucrats at Vienna. May the King of Austria hereby understand, it was not God looking away at the Austrian Empire, it was the failure of their Kings, in which saw the meaning of nothing but total rule, which ended their once semi-decent Empire, one could never do what even the so called, “Enemy Empire”, better known as the Ottoman Empire could do, and that is the acceptance of local people ruling themselves. "The Artic voyage seemingly had been cursed Reginald Hinchcliffe thought to himself. First the atlantic storm broke their mast, and now only 2 weeks out of St.Johns they were lost in fog, barely being able to dodge icebergs and islands Captain Hinchcliffe ordered the ship to turn south, hoping to land in Algonquin territory in the north or maybe to enter Hudson Bay. But instead within hours in the heaviest of fog the ship crashed into a large land mass sending a quarter of the crew over board. Once the fog began to clear the Captain and his men began assessing the situation, they figured they likely crashed on the northern coast of algonquin territory and began unloading all the supplies they could carry in hopes they can make contact with the Algonquin and get south to the colonies..but it was not that simple. While the sun went down it got bitterly cold and the crew were forced to build shelters and fires and then a massive storm blew in hunkering down the Captain and his crew for another week. When the storm lifted a small tribe of heavily clothed natives approached the camp, they had very long spears and thick fur clothes, they seemed completely awed by the ship and were crawling all around it with their eyes wide. Even though the native tribe who were come to be known as the Slavey(Inuit) loved the ship it was utterly useless to the crew and Captain Hinchcliffe now as half the hull was destroyed and there were absolutely no trees in sight to repair it with. The Slavey traded many furs and some meat to the Captain and Crew and told them if they were to survive they must head south, going south they would see many pine, spruce and evergreen trees and were to pass them. The Slavey did not know much else of what was south of the trees but it was the Captain and his crews only hope. The Slavey departed into the barren frozen wasteland and the Captain and his Crew packed up and headed south, it would be a long a treacherous journey but having meat now in their bellies the crew were optimistic." You owe me a new keyboard ---- I just snort-spit coffee all over my desktop I was laughing so hard. Bohemia, a moderate sized Kingdom of great history and promise, had come under strain from previous years of mismanagement and poor rulership. Having come to the throne just 3 years prior, King Vladislaus II has made steady, markedly important improvements to the Kingdom of Bohemia. Not only has he and his advisors pulled Bohemia out of an economic slump, rebuilt the military, reformed public and domestic infrastructure, but also brought upon a new age for all Bohemians. Seeking to expand his Kingdom's domain into new areas, his Majesty, to his delight, found an excellent opportunity arise in the neighboring lands of Silesia, which had for some time been plagued by religious turmoil, causing violence and a gradual decrease in public order to accrue. These turn of events had inevitably drove away many of it's citizens into Bohemia, whilst disrupting trade and any general sense of cohesion. To capitalize on the showing of Silesian weakness, it was decided that King Vladislaus II would lead a combined Bohemian army of over 21,000 men, artillery, and cavalry into the heartland of Silesia, on the pretense of restoring the catholic faith back into Silesia, along with the annexation of lands which allowed "Heathens and Heretics to run rampant. Within the winter of 1475, the armies of Bohemia struck fast and true, with wave after wave of newly raised and often poorly equipped Silesian militia either being utterly defeated, or routed. In the coming days, the march on, and the eventual occupation of Silesia's capitol, Oppelin, would end, along with the short-lived conflict. The eventual incorporation of Silesia's territories are planned to commence within 3 months or so, while patrol's are to be sent out to hunt down any remenants of Silesian royalist and Heretic groups. With the fighting over, King Vladislaus II returned to Prague victorious, with the people, nobleman, merchants, and foreigners alike greetings his Majesty warmly and claiming this as a proud moment for the Kingdom. In order to properly secure the countries stability, and to further legitimize Bohemia's claim to the subjugation of Silesia's provinces, envoys had been sent to the surrounding Germanic Kingdoms, Counties, Duchies, and independent Principalities, with cart's full of tribute, gifts, and promises of friendship. In this way, King Vladislaus II having secured Bohemia's borders for the time being from External threats, will be able to have time to focus on his Kingdom's internal threats, threats that could unravel all that he wishes to achieve. The post was edited 2 times, last by Colonel Reevess ( Aug 30th 2017, 3:28am ). An explosion of trade was initiated after the agreement between East and West Germany was signed by their respective officials. This agreement may be the turning point that lifts West Germany from it's slight depression it got into. Vietnam has also begun trade negotiations with West Germany, to the mutual benefit of our nations. All of Germany celebrated when East Germany announced that there would be full, but controlled, trade between the East and West. This was due in no small part to the treaty that was signed between West Germany and the USSR. As it has been well kept (with minor incident), the East decided it was all right to allow this trade. There are a few skeptics though, on both sides. The ones in the West claim the East is only trying to get better technology from them and the ones in the East claim that the the West is using this to insert spies and agitators. A violent attack has occurred in the Chechen province of the USSR. During the night unidentified insurgents attacked a military compound housing new recruits. 17 were killed and 23 were wounded. The Soviets responded by heavily bombing and artillery striking the enemy's known camps killing more than 100 rebels. Additional forces have been committed to the region to prevent further incident. West Germany applauds the Soviets for their quick response and congratulates them on a successful raid. We hope that no further incident springs up. After months of waiting we have finally received a report from the Spanish about what has been happening in their gruesome conflict. The fascists have made an unexpectedly large gain, and the casualties have been tremendous for the loyalists. On the fascist side, they have taken 517 thousand casualties out of an estimated strength of 15 million. On the loyalist side things are looking very grim. Out of an estimated size of 7 million they have lost 1.2 million soldiers and only control a little more than a quarter of Spain. West Germany grieves to hear of this sad turn of events and offers it's service to the loyalists should they choose to receive it. The US has announced that Iranian special forces have infiltrated the Bystar Naval Airstation and attempted to destroy the aircraft stationed there. This attack was unsuccessful and all operatives were killed on sight. In response, the US imposed embargos on Iran and Egypt (as it was assumed that they arrived via the Egyptian airfields) and carried out a heavy bombing raid on an Iranian airbase in Tehran. West Germany has currently released no comment besides that it will be neutral in the conflict unless something happens to draw them in. Libya has announced that peace (for the time being) may be around the corner. Egypt, the USSR, and Iran have signed peace agreements with Libya. As of yet, Poland has not responded but Libya believes it's only a matter of time. Libya is also outraged that several wartime laws that have been violated and intends to prosecute the USSR and Iran for several offenses in the UN.The Sainai War has been a brutal and shocking conflict and West Germany and the rest of the world are glad it looks to be nearing the end. China is growing restless over the apparent re-militarization of Hong Kong and have announced their concerns this month. This comes after asking that Canadian forces vacate the region as even though the were commonwealth they were still considered NATO forces. West Germany hopes that the nations involved can settle their differences before it escalates into something more alarming. Vietnam announced that it's Economic program was advancing smoothly. To further it's goal of going full economic, trades have been negotiated with West Germany for the mutual benefit of each other. These trades will also help to cement a growing friendship between the two countries. So.....what does a man have to do to get an RP around here? "Om Namah Shivaya....Aham Namah Shivaya"
hundreds of civilians flocked around the Arkansas Capital Building awaiting the State Governments announcement on whether or not they would secede from the Union and join the newly formed Confederate States of America. The crowd became silent as Governor Henry Massey Rector approached the podium, He was flanked by several armed men in grey uniforms armed with Springfield Model 1855 Carbines. "The people of Arkansas shall join our Southern Brothers in the preservation Southern Political and Economic Dominance over the Northern States. As Lincoln prepares to march troops down South to crush our constitutional given right to leave the Union he will be met by a fury of thousands of Arkansas Soldiers joined by soldiers from every state in the Confederacy. We will drive the Yankee's back to the North were they will stay as our trade ships sail across the globe as we hold the Great Powers at our finger tips by our massive stocks of Cottons which their economies solely rely on. The North believed that we would stand by as they destroyed our way of life, they have never been more wrong. Thirty minutes from now four hundred Arkansas Soldiers loyal to our cause shall crush the approaching contingent that is approaching our beautiful city. To arms men and women today we shall show the Confederacy that we deserve to join their ranks!